Banda Black Rio is a Brazilian musical group from Rio de Janeiro that was formed in 1976. It has a repertoire based on funk but also including samba, jazz and Brazilian rhythms. 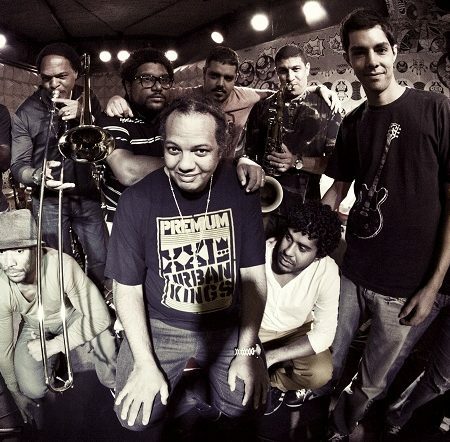 Compared to other soul-funk groups, such as Kool and the Gang and Earth, Wind and Fire, Banda Black Rio developed a particular style of instrumental soul music fusing together elements from a number of genres. The present band are the sons of the original members. Two albums came out from this new generation of Black Rio. Rebirth released in the 2001 and Supernova samba funk in 2012. Banda Black Rio est un groupe brésilien originaire de Rio de Janeiro formé en 1976. Son repertoire est principalement funk mais inclut également des éléments de samba, jazz et rythmes brésiliens. Comparé à d’autres groupes de soul-funk tels que Kool and the Gang et Earth, Wind and Fire, Banda Black Rio a développé un style instrumental de soul music, qui mélange des éléments de nombreux genres.